by Amy Yasmine. Styled by Mughni Che Din. Photographed by GT Gan. On Liv: Shirt; dress; and shoes, all from Fendi. Ring (on right); necklace; and earrings, all from Van Cleef Arpels. Ring (on left), Liv’s own. On Henry: Shirt; sheer jacket; and trousers, all from Fendi. Watch, Van Cleef & Arpels. I’m not going to lie, it’s a strange feeling to be sharing a bed with one of Asia’s most Insta-famous couples. 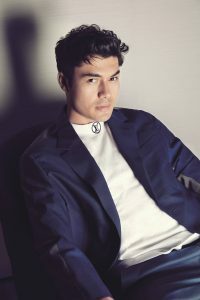 Even stranger is that one-half of that couple, Henry Golding, is a friend from way-back-then, has now taken on Hollywood with his latest role as Nick Young in Crazy Rich Asians, and is set to star alongside Blake Lively and Anna Kendrick in 2018’s A Simple Favor. On the other hand, we have Liv Lo, one of Singapore’s most inspiring fitness personalities, model, and aspiring techpreneur, who just launched her online venture Fit-Sphere.com. Such forces to be reckoned with, and I’ve just plopped myself down next to the couple in an oversized tee and expandable trousers, with neither a possible Academy Awards nomination in the future, nor abs of steel to flaunt. As the power couple walks into the penthouse suite at InterContinental Singapore Robertson Quay at exactly 10am (I know this, as I heard Liv’s chirpy voice echo through the room just as my alarm went off), the crew is greeted by their infectious charm, with hugs galore across the room. “I haven’t seen you in ages!” Henry says, before gesturing towards his bubbly wife, dressed in a lace-up Zimmermann dress that’s part-surfer-chic, part-Talitha Getty. “Remember Liv?” he nudges, all the while gazing adoringly at her. Of course, how could I forget? The first time I met Liv was back in 2015, at a mutual friend’s wedding where Henry was the best man. At first glance, Liv possessed all the elegance of an Italian screen siren and the electrifying spirit of a romantic bohemian. Effervescent, vivacious, and altogether alluring, it was clear why Henry had fallen head over heels with the Italo-Taiwanese. A perfect pairing: her wit complemented by his humour, his tenacity matched only by her inimitable fire. Jumpsuit, Chanel. Earrings; and ring, both from Chopard. Since then, the couple has conquered some great heights and more. In 2011, Henry moved from Malaysia to Singapore after being offered the presenter role for the BBC News’s The Travel Show, while juggling the 8TV travel series Welcome to the Railworld Japan and filming with Channel News Asia. At the same time, Liv was also making a name for herself through various acting roles in 2014 such as playing Sophie Thomas on Mediacorp Channel 5’s Point of Entry series, as well as high-profile interviews where she rubbed shoulders with Hollywood A-listers from Chris Pratt and Chris Evans to Mark Hamill. Suit jacket; and top, both from Louis Vuitton. The same could be said for Liv. A risk-taker at heart, the former model traded billboards in Shibuya for projects in the realm of wellness. “I wanted to exercise as a model, but I wasn’t able to get toned or be active; it just wasn’t part of the physique,” she shares. “So when I stopped modelling, I made the conscious decision to dedicate myself to fitness, and once I went down that path I just couldn’t turn around.” Four years and a diet change later, Liv is now a vegetarian, and her sculpted frame is proof of that. But leave it to a multi-hyphenate to take things a little further, adding Fit-Sphere.com to her bow while being a TV host and a yoga instructor. “It is mentally and physically exhausting because I could go from hosting or being at a photoshoot to teaching a yoga class or practice in the evening,” Liv explains. “It’s a two-way job, but it’s something that I love to do.” And no kidding—in 2017 alone, Liv taught 226 classes and reached 4,705 students. But with a manic schedule jet-setting across continents for work obligations, the question remains: how do “The Goldings” even keep up with themselves? On Liv: Top; skirt; and shoes, all from Bottega Veneta. Watch; earrings; and ring (on right), all from Cartier. Ring (on left) Liv’s own. On Henry: Jacket; sweater; and trousers, all from Bottega Veneta. Watch, Cartier. How Rachel Young, I thought, as her sentiment calls to mind Henry’s love interest in Crazy Rich Asians. Surprising, considering their sense and sensibilities. “We don’t really splurge on our lifestyle, we just take in whatever interests us at the time,” Henry adds. “We’re saving up for a house, so we’re pretty sensible with our cash.” A far cry from the materialistic-driven world Crazy Rich Asians portrays. But one thing’s for sure, as revealed through our quick-fire series of interview questions—one, is certainly crazier than the other. “She’s unpredictable!” Henry exclaims, jokingly. “She changes her mind quite a lot, but she’s very outgoing, which is great.” To which Liv cheekily responds, “So I spice it up, but Henry doesn’t mind … lucky!” In love, too.